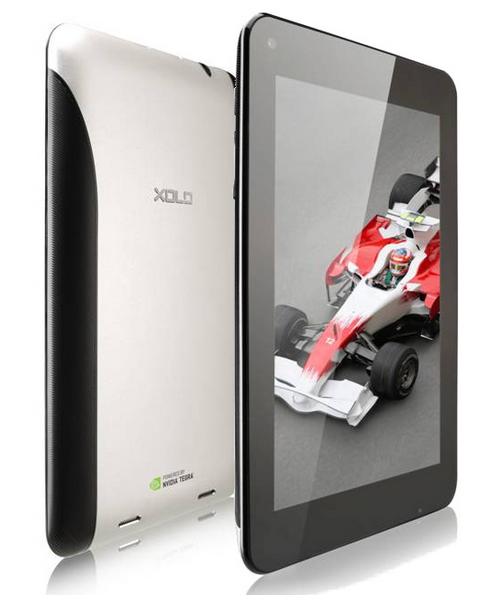 Xolo has launched its 7 inch Nvdia Tegra 3 tablet, Xolo Play Tab 7 for Rs. 12,999. Yes the tablet has been priced competitively and comes with admirable hardware specifications. The tablet was announced last month along with another upcoming tablet, Xolo Tegra Note, which Xolo claims will be the fasted 7 inch tablet in India. The tablet comes with a 7 inch IPS LCD display with 1280 x 800 pixel resolution, which gives you a pixel density of 216 ppi which is pretty good for this size tablet. The operating system employed is Android 4.1 jelly bean. The tablet is powered by 1.3 GHz quad core Tegra 3 processor assisted by ULP GeForce GPU. This processor will be supported by 1 GB of RAM for smooth UI transitions. The storage capacity is 8 GB and can be further extended to 32 GB using MicroSD support. This tablet comes with a 2 MP front facing camera and is 10.6 mm thick. It weighs 338 grams which is almost same as Nexus 7 first generation tablet. The tablet comes with a 4000 mAh battery which is comfortably above average. The tablet supports Full HD video playback and Nvidia Tegra games. Connectivity features include Wi-Fi, Bluetooth 4.0, micro USB and 3.5 mm audio jack. Lack of 3G is little disappointing. There is no SIM card slot for calling either. This is the second tablet from Xolo to hit the market and its main competition will be first generation Nexus 7 which comes with similar specs and better brand valu, and is now selling for lesser price of Rs.9,999 after the recent price cut. Other competitors include Simmtronics Xpad Mini and Domo Slate X3G 4th.